Introducing this sweet potato muffin recipe today, I’m in high hope that you guys could get the best out of your leftover potatoes, like I did. You know, sometimes it’s hard to incorporate tasty, sweet treats into our diets without feeling guilty afterwards. With regards to muffins, normally, I would let bananas and pumpkins have a turn on the blog. Then, one fine day, I woke up after a food coma to be in a divided mind: should muffin’s splendid texture and flavor be limited to bananas and pumpkins only? The answer you might have guessed – of course not! Sweet potatoes cropped up my mind right after that. They bear a smidgen of resemblance to pumpkin in texture and color, yet they’re sweeter and more moist; so, why not? A fresh batch of boiled sweet potatoes is the problem-solver, but the well-drained canned ones would probably fit too, since you’ll mash them to softness and smoothness eventually. People are also using yams as substitutes for sweet potatoes elsewhere (you see, yams are called orange-fleshed potatoes for reasons), but I wouldn’t recommend you do so. Yams appear to be too starchy and sturdy for me. So, if I had to give yams a chance, I believe I would have to remodel the recipe from head to toe. Rather than a sweet spud treat packed with sugar, to me, these sweet potato muffins could really rival any of the store-bought muffins, mostly thanks to the crispy and nutty pumpkin seeds. Aside from pumpkin seeds, you can also mull over flax seeds, hemp seeds, chia seeds, sunflower seeds, and raisins. I’m pretty sure they’ll make the best burst in flavor when paired with raspberries or cranberries, and especially chocolate chips. Honestly confessed, at the time of cooking, I was too shiftless to throw myself outside to the nearest store, so I simply stayed with pumpkin seeds. Maybe next time, haha (just so I got a legit reason to replenish my desire for this sweet bake treat once again). How do you make sweet potato muffins? Baking a regular batch of muffins may not be anything exotic for home cooks these days. Normally, the oven does all the fancy work for you, excluding kneading and whisking. So, don’t be surprised just yet, because a successful batch of these sweet potato muffins is even simpler. It’s just the job for your left hand! If bread dough has always put you into some very real, intellectual challenges, then I’m confident in saying sweet potato muffins will be your go-to sweet snack now. No more sweating over perfectly kneaded dough. Now, the blender can accomplish the job for you. As mashed sweet potato is the main ingredient, the muffins are naturally sweetened without much effort. 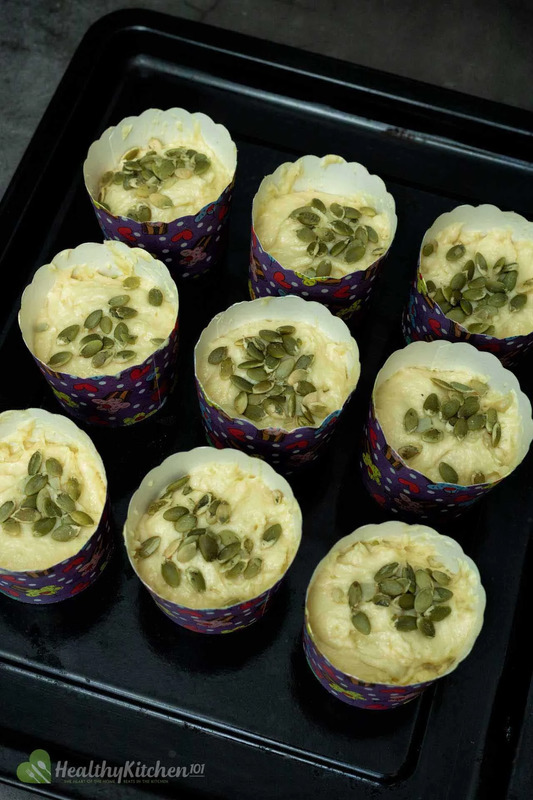 After mixing the mashed potato together with the remaining ingredients, you scoop them into the paper muffin cups and let the oven finish it off. What else can you make with sweet potatoes? Sweet potatoes can be enjoyed when roasted and combined in salads, burgers, or patties; whereas steamed or boiled potatoes are best served in curries and pies. What to serve with sweet potato muffins? …Yes, of course. Well, it’s not like I’m asking you to have it in teaspoons or something. I mean, why shouldn’t we jam-pack it with toppings and teeny weeny sprinkles of everything, little by little, while we’re legitimately allowed to do so? For example, whipped cream – it’s both convenient and terrific in taste; plus, you can always make a batch of it within your household. The process is pretty simple: use a mixer to beat a certain amount of full-fat milk (any kind of milk works) until it’s fabulously creamy and fluffy. In advance, breaking the muffin off in pieces and taking proper bites of them, dipped in plain milk or hot coffee, is also an incredible way to devour these tiny, lovely, sweet treats. Sweet potato muffins are edible within 3 months if kept in the freezer, so, hectic prep for a creative breakfast is no longer in the scenario. Microwaving them until they’re soft is the best way to reheat. Wash and chop the sweet potatoes into thin slices, then boil until well-done. Mash them by hand or simply run them through a blender until completely soft and smooth, then set aside. Combine the dry ingredients in a medium bowl: cornstarch, whole-wheat flour and salt. Set aside. Mix together the blended sweet potato, beaten eggs, butter, syrup and milk. Stir in the dry ingredients until they're fully incorporated and moistened. Preheat oven to 375°F. Line the baking sheet with 12 muffin liners. Coat the muffin liners with nonstick spray, then scoop the muffin mixture into the liners (up to 3/4 of the capacity). Sprinkle them with extra sugar or toppings if desired. Oven-bake for 25-30 minutes. After that, you can check their doneness by inserting a wooden pick and see if the pick comes out clean without any tiny muffin scraps stuck to it. Let them sit for another 5 minutes, then remove the pan from the oven. Serve alone while still hot or slather some whipped cream on. For leftovers, you can reheat them in the oven for a couple of minutes.